Imagine one morning being at the hospital, not because you’re sick or visiting a loved one, but because you work there. Your station is the front desk and everyone loves to be around you because you’re a loving and an energetic person. Patients know you by name and you’re good friends with the doctors. Then the next minute you get a phone call and the person on the other end tells you, “You have cancer.” Over ten years ago, Bonnie Hood received that phone call at her job. It was in that moment that her life would be changed forever. “We were both standing at the front desk when they called me,” said Hood, as she referenced back to when her coworker and friend was standing next to her as she received the news. A few days prior Hood’s primary doctor asked if she had ever taken a mammogram test. When she stated she hadn’t, her doctor immediately advised her to take one just to be on the safe side. She admitted that she had been avoiding it and that she was overdue. Little did she know that the cancer was already in her system. The cancer had been caught early and doctors were able to perform surgery. Hood was cancer free. However ten years later, a knot was found in her neck in which she was told she had cancer again. This time around the cancer was already in Stage 4. “I never knew anyone with cancer until I was told I had it,” said Hood. “And the second time they wouldn’t have found it if the knot didn’t come on my neck.” The news was devastating to hear again, but Hood found peace with the situation. In Hood’s early years, she served in the United States Air Force for three years and also as a death interpreter. She is now receiving home treatments from Hospice Care, a medical facility that provides care and support for patients that are facing long term illnesses. She has her own personal nurse that comes to her home and the support of her husband right by her side all day. She is appreciative for the time she has on this earth and is fully aware of how harsh her condition is, but her faith in God keeps her optimistic. Hood encourages women to get their mammogram done and to also know your family history – even if cancer doesn’t run in your family. Her good friend and previous coworker, Nancy Sheldon, is a mammogram tech that has been there for Hood over the years. Like Hood, Sheldon also encourages women to do a self breast exam once a month and have their breasts checked by their doctor once a year. Going for annual checkups is extremely important, starting at the age of 40, or younger if breast cancer runs in your family. Through the years Sheldon has known Hood to be a loving and cheerful person, always smiling despite of her pain and weakness. Hood has the love of God, her husband, family, friends and church members to carry her on each day. 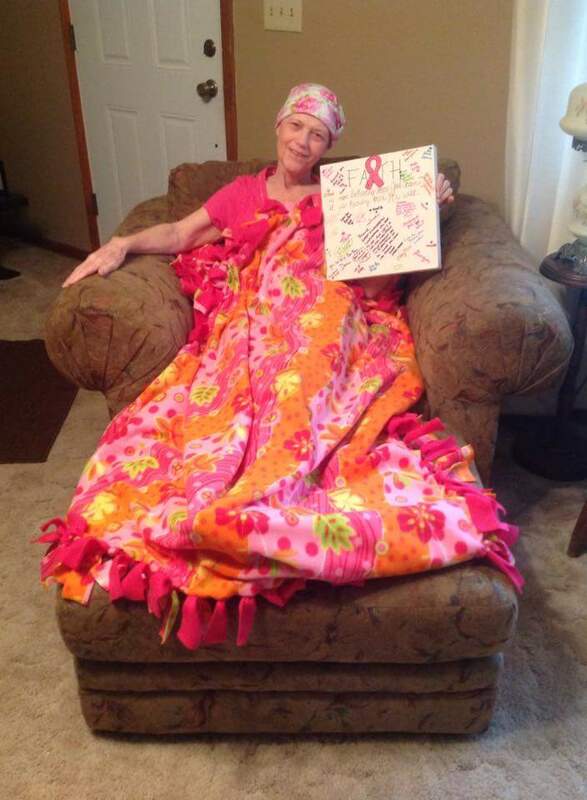 She is prepared to attend the Making Strides Against Breast Cancer Walk on Oct. 24, 2015, with her team cheering along. “Maybe I’ll be out there with someone pushing me along in a wheelchair,” stated Hood with a laugh. Before this article made it to press, Bonnie Hood passed away on November 11, 2015. A Veteran herself, Bonnie Hood never stopped fighting, never stopped caring, and never stopped smiling. Rest in Peace Ms. Hood, we thank you. She was one of a kind and loved by many. She taught my son in Sunday School and was always positive. Me and my kids love her and are praying for her family. Bonnie Hood was an adopted aunt to me while i was growing up. Thank you for letting others know what those of us that knew her already knew. That she was one of the kindest people that there has ever been. Rip aunt bonnie. U will b missed. Bonnie was married to my cousin, dear Walt, but I never considered her anything but my cousin. She was a light in our family, and things will be dimmer without her in my life.